A thermodynamic system is defined as a fixed mass in space under thermodynamic consideration to analyse a problem. 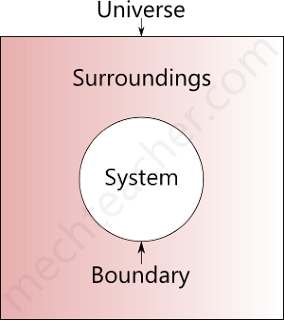 The system is identified by a boundary drawn around the system which may be real or imaginary. Across the boundary, the energy transfer in the form of heat and work takes place. Shape, volume, position of boundary may change during energy exchange with the surroundings. Everything external to the system is called surroundings or environment. A system and its surroundings together is called the universe. Based on the mass and energy transfer between the system and the surrounding, the system can be classified as - Open system, Closed system and Isolated system. 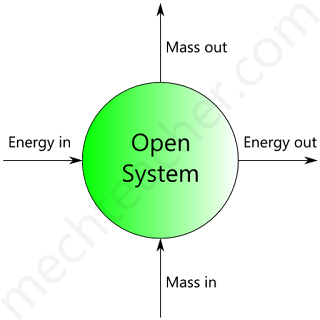 A system with mass transfer along with energy transfer across its boundaries is called an open system. Fig a. shows open system which consists of turbine. It should be noted that the matter across the boundary of the system as the high pressure gases enter into the turbine and low pressure gases enter into the turbine and low pressure gases leave the turbine. Also, it is not necessary that the quantity if matter within the boundaries of an open system to remain fixed. A system without mass transfer across its boundaries is called a closed system. Such systems have only the energy transfer in the form of heat and work with its surroundings across the system boundary. If there is no mass and energy transfer between the system and surroundings, the system is said to be an isolated system. Hence, according to the definition, universe is an isolated system. Handy example of isolated system is themos flask.